The stoles in this category are primarily of interest to Schools & Churches as they are not personalised (unless required) & can be used at any time for various Sacraments. There are also 'Class Sets' of stoles where a number of 'generic' stoles are purchased by the School. These stoles are 'loaned' to the candidates for the ceremony, then collected & re-used by next year's candidates. A fantastic cost saving for both the parents & the School. CONFIRMATION STOLE / SASH CLASS SET NON-PERSONALISED This Confirmation Stole / Sash was created as a possible design for a 'School/Class Set' where the stole will be re-used every year by the school or Parish for the children receiving the s.. CONFIRMATION STOLE / SASH CLASS SET NON-PERSONALISED This Confirmation Stole / Sash was created as a design for a 'School/Class Set' where the stole will be re-used every year by the school or Parish for the children receiving the sacrament ..
BLANK 1.5m RED STOLE / SASH This blank red stole sash is ideal for any embellishment you desire or to suit the requirements of your Church or School for the Sacrament of Confirmation. 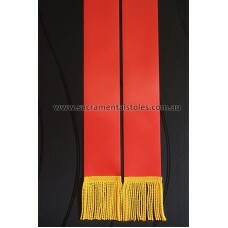 This stole is created from 76mm (3") wide luxurious woven ed..
SCHOOL / PARISH LOGO 1.5m WHITE STOLE / SASH This design is available to Schools or Churches onlyThe School Logo is added to the stole in the position desired by the Parish or School.This 1.5m stole can be used for all Sac..